Check back here regarding the upcoming Evening with Angela Davis, exploring modes of systematized inequalities within education and incarceration, and question the liberating role of education. 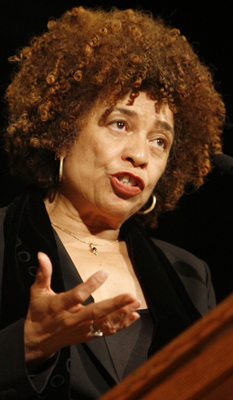 Angela Y. Davis is known internationally for her ongoing work to combat all forms of oppression in the U.S. and abroad. Over the years she has been active as a student, teacher, writer, scholar, and activist/organizer. She is a living witness to the historical struggles of the contemporary era. Professor Davis's long-standing commitment to prisoners' rights dates back to her involvement in the campaign to free the Soledad Brothers, which led to her own arrest and imprisonment. Today she remains an advocate of prison abolition and has developed a powerful critique of racism in the criminal justice system. She is a member of the Advisory Board of the Prison Activist Resource Center, and currently in working on a comparative study of women's imprisonment in the U.S., the Netherlands, and Cuba. During the last twenty-five years, Professor Davis has lectured in all of the fifty United States, as well as in Africa, Europe, the Caribbean, and the former Soviet Union. Her articles and essays have appeared in numerous journals and anthologies, and she is the author of five books, including Angela Davis: An Autobiography; Women, Race, and Class; Blues Legacies and Black Feminism: Gertrude "Ma" Rainey, Bessie Smith, and Billie Holiday; and The Angela Y. Davis Reader.